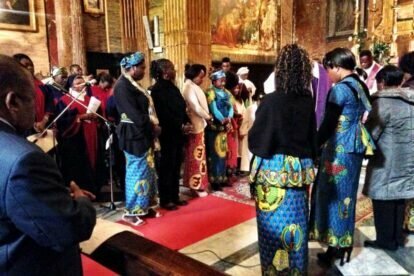 Every Sunday at 11:00 the Congolese community celebrates the Holy Mass in their peculiar, joyful way inside the Chiesa della Natività del Gesù, a tiny 17th century church in Piazza Pasquino. The Mass is celebrated in three different languages (Italian, French and Lingala), but the main attraction is -without a doubt- the ‘Bondeko’ choir that, with songs written in the four official languages of Congo, creates a special atmosphere of joy: a true tribute to life. I’m not a religious person, but I love to attend this mass because of its atmosphere. As soon as the electric guitar begins playing, the worshipers stand up and clap along with the music; a warm enthusiasm spreads across the small church and everybody dances to some joyful music sung on bongo drums. The merry atmosphere peaks with the offertory, when the worshipers place baskets full of oranges, pineapples and sugar on the altar and -it goes without saying- the procession bringing the gifts is accompanied by yet more singing and dancing.